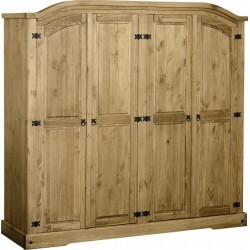 Four Door & Large Wardrobes There are 76 products. 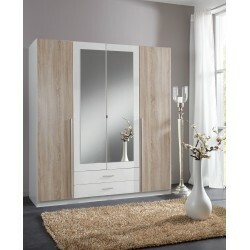 Matt White and Modern Oak Effect Wardrobe 2 Mirrored Doors 2 Drawers Flat Packed Height 198cm, Width 180cm, Depth 58cm. White door and drawer fronts on a white carcass. Connect Kew 4 Door Wardrobe with 4 Drawers- High Gloss White High Gloss White door and drawer fronts on an Oak carcass. Connect Kew 4 Door Wardrobe with 2 Mirrors- High Gloss White.High Gloss White door and drawer fronts on a Oak carcass. A oak with glossy grey fronts ideal His & Hers sharer 5 door wardrobe, perfect for any contemporary household. Mirror doors included for space efficiancy. A white with glossy grey fronts ideal His & Hers sharer 5 door wardrobe, perfect for any modern household. Mirror doors included for space efficiancy. The Connect Euston 4 door wardrobe with 4 drawers is a perfect storage solution for any space; or you can attach this to our other Euston wardrobes easily with it's pre-drilled carcass. Oak door and drawer fronts on a White carcass. The Connect Oval 4 Door Wardrobe with 2 Mirrors is a perfect storage solution for any space; or you can attach this to our other Oval wardrobes easily with its pre-drilled carcass. High Gloss Mocha door and drawer fronts on a Oak carcass. The Oval 4 door wardrobe with 4 Drawers is a perfect storage solution for any space or you can attach this to our other Oval wardrobes easily with its pre-drilled carcass. High Gloss Mocha door and drawer fronts on an Oak carcass. The Hyde 4 door wardrobe with 4 Drawers in white & perfect storage solution for any space or you can attach this to our other Hyde wardrobes easily with its pre-drilled carcass. High Gloss Mocha door and drawer fronts on a white carcass. The Connect Eutson 4 Door Wardrobe with 4 drawers is a perfect storage solution for small spaces; or you can attach this to our other Euston wardrobes easily with its pre-drilled carcass. Oak door and drawer fronts on a White carcass. The Connect Eutson 4 Door Wardrobe with 2 Mirrors is a perfect storage solution for small spaces; or you can attach this to our other Euston wardrobes easily with its pre-drilled carcass. Oak door and drawer fronts on a White carcass. The Camden 4 door wardrobe with 4 Drawers is a perfect storage solution for any space or you can attach this to our other camden wardrobes easily with its pre-drilled carcass. High Gloss Mocha door and drawer fronts on a white carcass. The Camden 4 door wardrobe with 2 mirrors is a perfect storage solution for any space or you can attach this to our other Camden wardrobes easily with its pre-drilled carcass. White door fronts on a White carcass. The Angel 4 door wardrobe with 4 Drawers is a perfect storage solution for any space or you can attach this to our other Angel wardrobes easily with its pre-drilled carcass. White door fronts on a White carcass. The Angel 4 door wardrobe with 2 mirrors is a perfect storage solution for any space or you can attach this to our other Acton wardrobes easily with its pre-drilled carcass. White door fronts on a White carcass. The Acton 4 door wardrobe with 4 Drawers is a perfect storage solution for any space or you can attach this to our other Acton wardrobes easily with its pre-drilled carcass. White door and drawer fronts on a white carcass. The Acton 4 door wardrobe with 2 mirrors is a perfect storage solution for any space or you can attach this to our other Acton wardrobes easily with its pre-drilled carcass. White door and drawer fronts on a white carcass. For beautifully considered bedroom furniture look no further than our co-coordinating ranges of wardrobes,drawers and bedside cabinets. Features durable silver handles and MDF molded fronts. Maximize your storage to fit your space by choosing from our most popular combinations. The Acton Plus 4 Door Wardrobe With 2 Mirrored Doors is a perfect storage solution for any space; or you can attach this to our other Acton wardrobes easily with it's pre-drilled carcass. White door fronts on a White carcass finished with silver handles.